JOSEPH LOUIS BARROW, the legendary "Brown Bomber," is considered by many to be the finest heavyweight champion in the history of boxing. He held the world's heavyweight title from June 22, 1937 until June 25, 1948 and made a division-record 25 successful title defenses. Born in Alabama, Louis moved to Detroit as a child and began boxing at the Brewster Recreation Center. In his first amateur bout, Louis was knocked down seven times. But he improved rapidly. 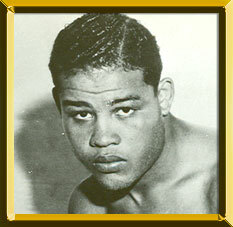 He captured the 1934 National AAU light heavyweight crown and turned pro later that year. Louis won his first 27 fights, 23 by knockout, beating the likes of former heavyweight champions Primo Carnera and Max Baer and contenders Paolino Uzcudun and Natie Brown. But in his 28th fight, Louis met defeat. He faced another former heavyweight champ, Max Schmeling at Yankee Stadium, and was knocked out in the 12th round. Louis rebounded from the defeat and won seven straight bouts -- including victories over Jack Sharkey and Bob Pastor -- to earn a shot at the heavyweight title. Louis faced champion James J. Braddock on June 22, 1937 in Chicago's Comiskey Park. Although he was dropped early in the bout, Louis rose from the canvas to score an eighth-round knockout. He became the first African American to win the heavyweight title since Jack Johnson in 1908. Louis possessed an excellent jab and power in both hands. His right cross was as devastating as his left hook. His punches were so compact that some in the media claimed a Joe Louis punch need only to travel six inches to render an opponent unconscious. After winning the crown, Louis began piling up defenses. He dispatched contender after contender with such ease that his opponents were said to make up "The Bum of the Month Club." Along with Louis' success came tremendous popularity. He was widely respected by Americans of all color. He won the title a decade before Jackie Robinson broke baseball's color barrier and later would put his career on hold to serve in the U.S. Army during World War II. Reporter Jimmy Cannon once wrote that, "Louis was a credit to his race ... the human race." While Louis generated countless highlights, he is widely remembered most for his 1938 rematch with Schmeling. The boxing public admired Louis for risking his crown against a man who, just two years earlier, had knocked him out. But because Schmeling was from Germany, the bout took on a broader meaning. The media inaccurately portrayed Schmeling as a Nazi and painted Louis as a symbol for the rest of the free world. The rematch, also at Yankee Stadium, was over fast as Louis scored a devastating first-round knockout. In another one of his most memorable bouts, Louis took on light heavyweight champion Billy Conn on June 18, 1941 at the Polo Grounds in New York. Conn, a masterful boxer, was ahead on the scorecards after 12 rounds. But miraculously, Louis scored a 13th-round knockout to save his title. After the war, during which Conn served in the Navy, they met again and Louis scored an eighth-round knockout. In 1947, Louis was dropped twice by Jersey Joe Walcott but managed to hang onto the title by a controversial split decision. The end was nearing for the great champion and shortly after he knocked Walcott out in a rematch, he announced his retirement. In 1950, at the age of 36, Louis returned to the ring to challenge heavyweight champion Ezzard Charles but lost a 15-round decision. He fought nine more times over the next year, beating the likes of Lee Savold and Jimmy Bivins but announced his permanent retirement when Rocky Marciano knocked him out on October 26, 1951.